I know that's not him in the picture but I still get to tackle this conversion as my next commission... spider legs and all. I can't wait to see how you do the spider half and the bionic leg. How soon do you think before we will see some work on that one? Beacause as we discussed earlier i built one with all the legs before the bionics came in. Ron, can't wait to see your vision of how he should look. Gent at the 40K club had a before and after model for his soul drinkers army. Before was a librarian model with a special rune like staff for the force weapon, after was a librarian top and the lower half a necron tomb spyder body. Steve: Soon, I have some work to finish on my Custodes before really getting into this conversion and posting progress. Fritz: This guy is mostly a scratchbuild. I'm trying to catalog my work as I go to show you guys in the coming weeks. I look forward to this! Should be a very fun mini to build! Peter: I didn't even know this guy existed until my client came to me with the commission. What little I know of the chapter and this guy seems really cool though... my client is very knowledgeable about the model and has a very clear vision of what's he's looking for so it's been a pleasure so far to build the model for him. i have some pics of the version i built a few years ago with the spider legs posted on my blog in a partially painted state. I am really interested in seeing someone else's take on this because I have never seen anyone else try it before. As I get things approved for the model, I'll share them here. It would be poor taste to post the stuff here and then show my client afterwards. It's definitely a cool model though, makes me want to start a Soul Drinkers force. I'm eager to see how you pull it off. I like the IDEA of the Soul Drinkers as loyal to the IDEA of the Imperium (but not the bureacracy). My one beef with the series is that the marines, who are indoctrinated to kill the mutant, believe that spontaneously growing a spider body and monstrous strength is a 'blessing from the emperor' and not, y'know, the TAINT OF CHAOS THAT MUTATION IS. Hi, just let you know, i'm the client for this model. In response to Raptor1313's 'beef', if you read the novels properly, you'll see that there are are number of reasons why the Soul Drinkers didn't kill Sarpedon on sight. 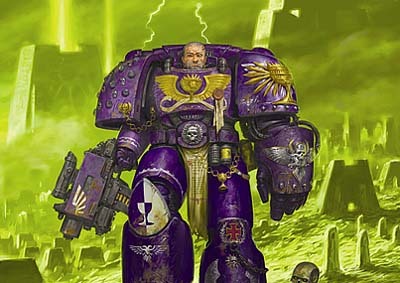 Thirdly, when Sarpedon mutated, those who had been with him on the Starfort (so had been corrupted) joined him whole-heartedly, while many of the other Soul Drinkers, including the novices, who hadn't been exposed to sarpedon's heretical belief's took up arms against him, causing the first chapter war. It's obvious if you read it carefully, why the Soul Drinker's judgement was impaired so much, but you've gotta consider the actions that led up to his killing of Gorgeleon, rather than just the fact that he spontaneously mutated. I was going to a few years back build a Sarpedon. I collected a large Railwars clockwork spider mini and Reaper Giant Spider and the necessary parts to make one. Maybe some day I'll get back to finishing it.